WBO junior middleweight champion Liam Smith is considering an offer from Saul “Canelo” Alvarez for his next fight. This would be the 25-year-old Canelo’s next fight on May 7 on HBO pay-per-view. Canelo needs a name that will attract fans. Smith doesn’t have a big name, but he does have the undefeated record that would make for a more appealing fight. The other names that are in the running for Canelo’s next fight are nothing special. If it’s a serious offer from Golden Boy Promotions for Canelo to fight Smith, then that might be the way to go for Smith and Warren. They don’t have a lot of options for big fights. Smith already beat one UK fighter in his last fight in defeating Jimmy Kelly by a 7th round knockout. If the idea is to keep Liam Smith fighting UK guys that the fans can recognize, then the WBO will need to work them, because there not too many available guys right now unless someone like Andy Lee can drop down from middleweight. Kell Brook might soon be moving up to 154, but he likely won’t do that for another two fights. Liam Smith needs to fight someone decent for his next fight because he’ll have a mandatory defense coming soon. Currently, Michel Soro is ranked No.1 by the WBO. That would be a tough fight for Smith, and he might not win it. Smith would be better off taking the biggest money fight while he can before he gets beaten by Soro or Austin Trout. If Smith faces Canelo, he would probably need to move up to middleweight. 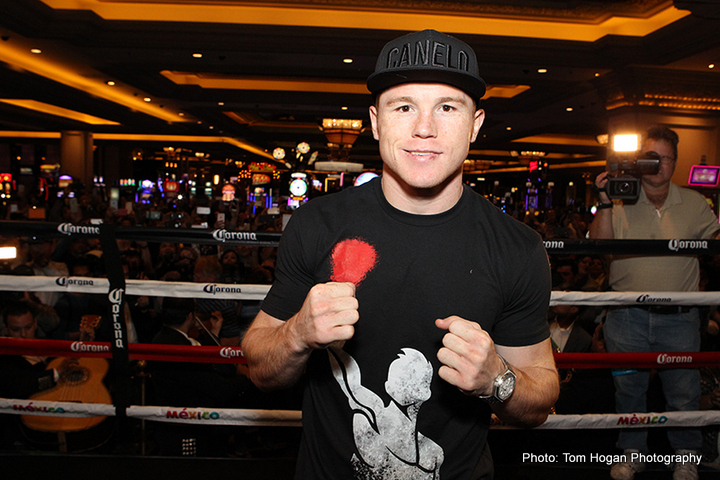 Canelo likes to fight at catch-weights, and that would make it easier on Smith if Canelo chooses to fight him at 155. It’s hard to predict what Canelo would do in a fight against a real junior middleweight like Liam Smith. He might want to make Smith come up all the way to 160. Canelo could then rehydrate more than he normally does and make come into the fight well into the 180s or the low 190s. Smith would have a lot of problems trying to beat a fighter as heavy as Canelo. It would be a little more than Smith is used to. But it’s hard to say with Canelo what weight he would fight in. If you predict that he’ll fight Smith at 155, you could be wrong. Canelo seems to fight at whatever weight suits him. As long as Canelo can make the 155lb catch-weight, he can rehydrate whatever weight he wants to. It’ll be up to Liam Smith to try and deal with his size and power. If he feels he can’t do it then he can always turn down the fight and take his chances against Michel Soro.